The title of this article elicits a good question and one I need to answer for myself. Beyond that, maybe you should take the time to think on it and try to answer it honestly, if you’re also a Christian. 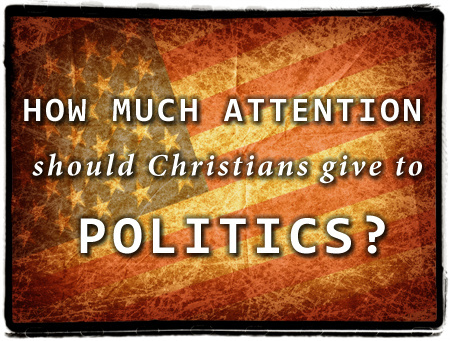 Christian and politics may not be the best combination. Ultimately, aren’t Christians required to be a light to a dark world? How can that happen when we respond to situations, events, or people as the world does? I’ve been guilty of calling people “idiots,” “morons,” and other things besides. I’ve justified using those types of labels by stating that the apostle Paul was sarcastic at times, called people some choice names, and by the way, so did Jesus. The problem though is that when Christians act or react like the world does to another person or situation, we are essentially being no better than the world. Therefore, why should the world ask us anything about salvation? If people in the world are lost – and most are – what about my character, my choice of words, the way I handle myself in a debate, etc., – will win them to Christ? If I’m honest, I’d have to say that “not much.” I can stand on principle all I want and make excuses for the way I speak/write, but in the end, does my conversation glorify Jesus? If I’m merely a “conservative” and not a “Christian,” then I don’t need to be concerned about that, do I? Such is not the case for me though along with hundreds of thousands of individuals who call themselves conservatives, patriots, and Christians. Is it better for me to sin and repent or not sin? Which will impress the world more? For me, if I cannot control my tongue, if I cannot discuss something political without resorting to name-calling, then what good is my involvement in a conversation? Not only is it not good, but it is counter-productive. I must be honest with myself and admit that I have felt ill will toward those who oppose conservative values. I have called them names, I have wished they would go away. Conversely, I have not prayed for their salvation. I have not wished them well. I have ultimately not seen them as though through the eyes of Jesus. I have allowed politics to become the motivating factor in my discussions with them. In essence, I have failed. Maybe you’re different. Maybe you can go head to head with people in the political realm with whom you disagree and feel no sense of ill will. Maybe you are never tempted to call them terrible names. Maybe you never have visions of them falling into deep dark pits and covered with horse excrement. Maybe to you, your involvement in the political realm is not divorced from your focus on the need of your opponents to know Jesus. The truth is that this is not the case for me and frankly, I do not want to “learn” how to do it. I’d much prefer to preach Christ and Him crucified than try to explain to someone why their political beliefs are a major harm to America. Let’s say I wind up “converting” someone to my side of the political aisle. Have they actually won anything? No. It’s after they are converted to the truth about Jesus do they actually gain everything. Jesus had some choice names for the pharisees, the religious leaders of the time. He didn’t extend that to the political leaders of the time. While He referred to Herod as “that fox,” (and it was not a compliment), Jesus did so on religious grounds, not political ones. Jesus did not demand change in society. He did not instruct His followers to demand change in society, even through peaceful means. Of course, Jews then were far more limited in Roman society than we are today in America. Yet, if we are going to be more concerned about overturning Roe v. Wade than fulfilling the Great Commission, I believe there is a problem. Why are we not that concerned for people’s salvation? For myself, I really don’t want to revisit this subject again, except maybe to remind myself of the pitfalls of being involved in the political realm. I want to understand that my limitations keep me from acting out my Christianity in the political forum. This does not mean that I can no longer comment on it or point out the way things are going in society and where it will all end. I can and should do that. In fact, I believe I have an obligation to do that, but working to change society? What I must refrain from doing is enter into pointless conversations about politics that not only win no friends, but push them away from any possible discussion about Jesus and their need for salvation. A number of years ago, I wrote a book about how apologetics really cannot save people. I wrote it because I believed then (and still do now) that debate often gets to a point where people simply dig in their heels in opposition. Too many times, I’ve seen normal conversation with opposing views turn into apologetic diatribes where “combatants” beat each other over the head with Scripture and their beliefs. Unfortunately, I have to admit that I can become too easily embroiled in such a ridiculous display of arrogance and lack of humility. Christians must avoid this at all costs and we must certainly avoid this type of asinine display in the political realm as well where our debates are not even that important when compared with eternity. Dominion theology has, unfortunately, played a large role in causing Christians to think that we can remake this world for Christ. That’s not what the Bible teaches at all and those who think it does are – in my opinion – sincerely mistaken. If you cannot – as a Christian – be involved in politics without hating your opponent, then I suggest you cannot be involved in politics. Stick with just being a Christian and allow Him to work in and through you so that you become a true beacon of light to those in this world – even other conservatives – who are dying without Him. Eternity is infinitely more important than the short length of our lives here on earth. Just something to consider. Entry filed under: Life in America, Religious - Christian - End Times, Religious - Christian - Prophecy, Religious - Christian - Theology, salvation. I too have been thinking about this lately and find it humorous (as in funny, not funny) that others here felt the same way AFTER our current president was elected, for the second time! Because that’s me, to a tee. One of the conclusions I’ve come to is to focus my energy on helping other Christians understand that their Christianity should inform their politics (vote) and not the other way around. Not that I have huge numbers of people I have influence over but within my circle of friends, children in Sunday School, ladies Bible study, and my own family of new voters and teenagers who soon will be old enough to vote. What’s become more of a shock to me, are the Christians who don’t know their theology and buy into the idea that they can somehow separate their Christianity from their politics. And pretty much every one of them are liberal or the type of Christian that’s given up on voting, being informed all together. But I totally agree on the anger/bitterness part and how we have to be careful not to be drawn into silly arguments and resist the temptation to call people names. That what I’ve been working on, with varying degrees of success! You wrote in these last two posts what I’ve been thinking ever since Obama was re-elected. Which is why I haven’t posted much on my QNO blog. I’ve even trashed a few posts-and I’m still working on it-that weren’t very Christ-like. I’ve also been noticing that some of the things I post on FB and Twitter from a Christian group or person have not been quite “right.” I’ve been trying to be careful there. I’ve tried not to post too much political stuff but Islam’s treatment of women just gets to me! Oh, anything inhumane done in the name of Allah…Aaargh! And, I’ve decided that when I see a FB political posting it means for me to pray for our political, spiritual and military leaders, that God will impart His wisdom to them as they carry out their leadership roles. The King’s heart is in the Lord’s hand and He will turn it any way He desires. Our prayers just might influence our God and Father as to which way to turn the King’s heart. My difficulty is that even though I know we are to pray for our leaders, it’s difficult to understand HOW to pray for them. It’s almost as though there is no faith behind my prayers, like I’m merely saying words. I will give attention to how YOU pray and go from there. Thanks for sharing. Regarding Islam, it is truly barbaric. I just saw images yesterday of Muslims tossing men accused of being gay off the rooftops to their deaths. While I disagree with the homosexual lifestyle, I would never want them hurt or killed, yet this is normal within Islam, just as it is normal to stone women to death who are accused of adultery. The atrocities, the butchery, and all the rest that are part of Islam are sickening. It is truly a religion of hatred and death. Yet still, Muslims need our prayers that the Lord will open their eyes. Fred, you really hit on some major topics here that most people don’t want to talk about. It seems, especially lately (maybe its been much longer) that there’s been an a fusion of prophecy with dominion theology. One site in particular I thought was a prophecy site (was at one time before they became Christian militants) but actually propagates a Christian army that will defeat the Muslim antichrist before Jesus’s return. So really I guess we the people will defeat the Anti-Christ without Christ’s intervention. I find this alarming. I don’t personally care who the anti Christ is because that is immaterial. But this is mixing prophecy with Dominion theology/ Kingdom Now and it is creating mass confusion. And then of course, the premillenial dispensationalists are cop outs and are too afraid to fight. Nothing could be further from the truth. We know we are facing horrific times ahead and our lives may/will be required of us. This is in God’s hands and his timing. The political arena will corrupt a person, regardless of their intestinal fortitude. And with dominion theology being so prominent these days, well meaning Christians actually think we can reclaim America for Christ. But nothing could be further from reality or more preposterous. And America is not Israel. This is not a popular viewpoint especially amongst the Tea Party group who really believe that we’re going to take this country “back.” Take it back from what to what? God has a plan for the ages. The Gospel is the only message we can invest in. It’s hard to not want to get in and try to changes something, or make a case for it. But like with social media, the message gets muddled. And the case for Christ alone is lost. Thank you for the message here. I would be interested in knowing more about that group that is ready to take on Islam. If you remember who they are, drop me an email, will you? Thanks for posting your comments and kind words. I agree with you. yes yes and may I say yes…I totally agree. We, as Christians can totally get side tracked by things of this world that will only be a whisp of wind in the long run. The only thing that really matters is being the light that beckons others toward Christ. Well said.